The results are in. For the past four months, ACE has been receiving submissions and interviewing entrants to the inaugural Canada's Best Workplaces for Employees Living with Arthritis. As we hoped, the application process delivered insights to further strengthen Canadian companies' approaches to creating a more productive and arthritis friendly workplace. During our exchanges with employees and employers, we also created opportunities for companies to assess their awareness of arthritis and support systems for employees living with the disease. 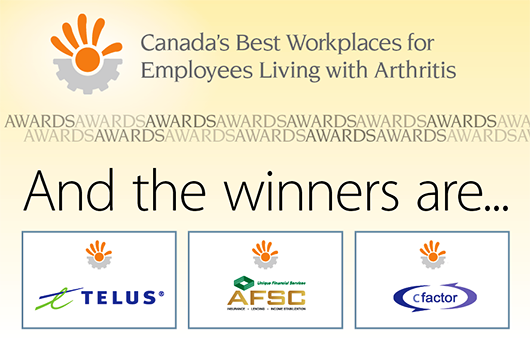 ACE is pleased to recognize the three companies awarded the 2014 Canada's Best Workplaces for Employees Living with Arthritis Award for their efforts to make their work environments great for everyone, including employees living with arthritis. Based on workplace insights shared by employees and company managers, the following companies stand out for best practices that take into account the unique concerns of employees living with the most common chronic disease in the workplace­—arthritis: TELUS, Agricultural Financial Services Corporation and cfactor Works Inc.
Employees living with arthritis working for these three companies commented in their submissions on how their employers assisted them by providing a comfortable, adaptable work environment whether 9-5 or late at night, in the office or at home. Managers at the three companies told us the positive return for offering progressive health and wellness programs include improved employee health and morale, healthcare cost control, increased productivity, and absenteeism / presenteeism reduction. Managers at TELUS, Agricultural Financial Services Corporation and cfactor Works also spoke of how nurturing a culture of well-being factored in broader motivations, including low turnover rates, attraction of top candidates, job satisfaction, and recruitment and retention of workers. Headquartered in Vancouver, TELUS is a leading national Canadian telecommunications company with more than 28,000 employees in Canada. TELUS stood out for making it easier for people with arthritis to thrive in their careers, and in the process also improve productivity and reduce costs associated with absenteeism and presenteeism. TELUS strives for a workplace accommodation policy that minimizes workplace barriers. For example, the company has established an ergonomics program to protect employees from work-related musculoskeletal injuries. In the TELUS employee submission, the employee told ACE that TELUS provided check-in visits, as needed, from an Occupational Therapist to review her health and determine if any further adjustments to her workspace were required. The TELUS employee credits the ongoing review process and subsequent physical workplace accommodations for relieving her of stress related injuries and possible flare-ups. TELUS offers a flexible health benefits plan that allows employees to choose the type of coverage that is best suited to their needs, including extended health, dental, health spending account, employee/spouse/child life insurance, and long term disability top-up plan. TELUS does cover biologics and other arthritis medications under its drug plans. The company's commitment to wellness extends to confidential health counseling services, on-site health screening clinics and the establishment of Wellness Centres at nine locations that offer a range of complimentary services including health screening, blood pressure and cholesterol checks and health events and workshops. Every day, according to Statistics Canada, 14.5 million people go to work at a small or medium-size place of employment. According to the Globe and Mail, small businesses account for about 4.6 million employees – 31% of working Canadians. These employers stand to benefit enormously from having healthy employees, since absenteeism, reduced productivity and other health-related costs cannot be absorbed as readily in small businesses as in large ones. ACE has recognized the Agriculture Financial Services Corporation (AFSC) as a leader in the medium size category for its investment in employee health and wellness. Based in Lacombe, Alberta, AFSC is a provincial crown corporation that provides farmers, agribusinesses and other small businesses loans, crop insurance and farm income disaster assistance. AFSC encourages its approximately 700 full time employees to balance work and their personal life with flexible work hours, shortened and compressed work week options and a formal earned days-off program that allows employees to earn up to 15 additional days off each year. Through its healthcare plan, AFSC offers employees coverage for prescription drugs and biologics as well as coverage for naturopathy, physiotherapy, chiropractor, massage, sports therapy and speech therapy. All AFSC employees receive a Health Spending Account to complement existing group benefits and provide employees with greater flexibility to manage health related expenses. Recognizing the unique needs of older employees, AFSC assists employees with retirement planning courses tailored to employees under and over 45, phased-in retirement work options and generous contributions to a defined benefit pension plan. Based in Saskatoon, cfactor Works Inc., with 55 full time employees in Canada, is a developer of Vibe HCM solution, a comprehensive Human Resource and Talent suite. cfactor works primarily with mid-to-large enterprises that represent hundreds of thousands of employees across a variety of industries. cfactor impressed ACE and ARC evaluators with its commitment to mobility and flexibility. For example, its downtown Saskatoon head office was designed through a collaborative process between architects, designers, and employees, which led to features to assist mobility challenged employees. The head office also has an on-site fitness center with free employee memberships and the company offers healthy food options for purchase at a nominal cost. cfactor employees are also provided access to ergonomic assess­ments with specialists to address physical workplace challenges. The cfactor employee submission rated the company's health and family benefits as very good, citing cfactor's flexible health benefits program and 100% employer paid benefits coverage with no waiting period for coverage for new employees. This is the inaugural year of the program recognizing the best arthritis practices of leading companies throughout Canada. There were 72 employers who were nominated representing a total employee population of approximately 140,000. Organizational Benefits (e.g. job accommodation, health insurance, reimbursement of prescribed arthritis treatments and services on extended benefit plan, short- and long-term disability benefits, work-at-home policies, job-sharing opportunities, flexible work hours, sick leave/well days off, leave of absence policy, return to work assistance, family leave, child care). Physical Workplace (e.g. workstation/ergonomics, on-site physical fitness facilities, stretch and fitness breaks, bike lockers/showers, healthy food options in cafeteria or vending machines). Employee Education (e.g. newsletters, internet/intranet site, employee counseling, roundtables, blogs and peer support groups). You're a working person who suddenly finds that you have arthritis. At first, you may deny that the condition is impairing or interfering with your performance on the job (and perhaps in the early phases of the disease that may be the case) but as the disease progresses, you find yourself having more and more difficulty discharging your primary responsibilities. Fatigue assails you; your pain levels rise inexorably; your joints are angry and inflamed. What can you do? You need to work. You have responsibilities to yourself and your family. As well, you didn't check your career expectations and ambitions at the door to your rheumatologist's office. You have always been an achiever who takes pride in being a competent contributor to your workplace. How do you square this circle? The difficulty in reconciling your disease with the demands of your working life is often greatly compounded for many people with arthritis because there is very little public awareness about arthritis disease and its systemic impacts on the mind and body. Isn't arthritis just something to worry about when you're old and creaky and ready to retire? That's still the prevailing image. But you're a very long way from checking out living conditions at the "Shady Acres Home for Retired Persons". No, you are most definitely not ready for the retirement home, but at the same time, your disease makes demands upon you that you simply must respond to intelligently—and in many cases if you fail to do so, you may hasten, rather than slow the progression of your disease and speed the day when you may be unable to work at all. Assuming the time has arrived when you may have to seek some form of "workplace accommodation", what steps should you follow and what can you expect? First, clearly define your needs. Then support your request with evidence or information from your doctor or healthcare provider as to your limitations (don't hesitate to seek professional advice or peer-provided information from ACE on any particular points you feel you need to clarify). You may have to request extra sick leave or some extra time off, an adjustment to your daily or weekly schedule, changes in your work duties, or you may need to secure certain ergonomic modifications in your workplace. If you foresee a need to be absent from work, detail how long the absence is likely to be and whether there may be possibilities of prolongation beyond what is known. You may wish to explore the possibility of working from home­—if that is something that is feasible in your job. These sorts of requests are usually considered "reasonable" in most circumstances and most types of employment, but bear in mind that no one size fits all. Dr. Diane Lacaille and her research team at the Arthritis Research Centre of Canada are in the evaluative stages of a study entitled "Arthritis and Employment: Making it Work". This project addresses the challenges of staying at work by offering information and techniques for managing arthritis while at work. Currently, this online program is being evaluated in a randomized controlled trial to test its effectiveness at helping people stay employed. Results are due sometime in 2015 or 2016 at the earliest with availability of the program to the general public at some point after that. If the results confirm the effectiveness of the program, the program will go a long way in helping people with arthritis remain employed, productive and motivated to continue working. We live in exciting times for arthritis research, and the work of Dr. Lacaille and her team fills a much-needed role in the realm of arthritis self-management and employment. Thanks to this work, coupled with increased awareness of the capabilities of employees with arthritis, more of us will be able to continue working with varying degrees of adaptations and adjustments, providing a win-win situation for both employers and employees alike. If you have a form of inflammatory arthritis and you are working in paid employment, you may be eligible to participate in this study. To find out more, please contact info@jointhealth.org.